Die Botschaft i Berlin, Tyskland: Bestill nå! Die Botschaft offers you a simple and easy accommodation in Berlin. Until 1990, the property used to house diplomats and various state institutions. 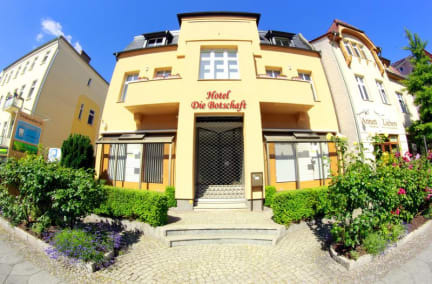 Die Botschaft is a small and tidy hotel, family owned and opened to public in September 2017. Every guest is welcomed as a family member and we always try to make your stay as pleasant as possible. Free Wifi is available throughout the property. Several bars, cafés and shops are located in the surrounding area. Public transports service can be found directly in front of the property, offering access to the city centre. Within a short ride away (10 min) there is the Tierpark Berlin or in the opposite direction the Kindl-Bühne Wuhlheide where festivals and concerts take place. 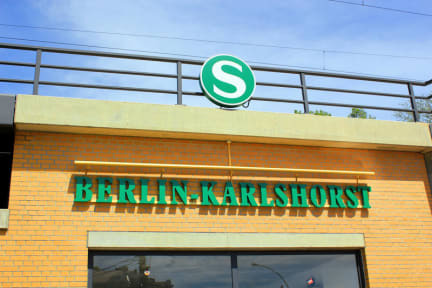 We are 3 minute walk from the Train station Berlin-Karlshorst. Alexanderplatz and the Berlin TV Tower is 9 km away. The nearest airport is Berlin Schönefeld Airport and it can be reached by a commuter train within 30 minutes. Cancellation policy: 24h before arrival. Payment upon arrival by cash, credit cards, debit cards (VISA, Mastercard, Cash, JCB, Diners Club, Union pay, Discover, V-Pay). This property might pre-authorize your credit card. Reception: open from 8 AM to 8 PM.